When you have a flat of peaches on your kitchen counter, ripening by the second, there’s a lot of pressure to come up with recipes to let the little fuzzy things serve their purpose in life. 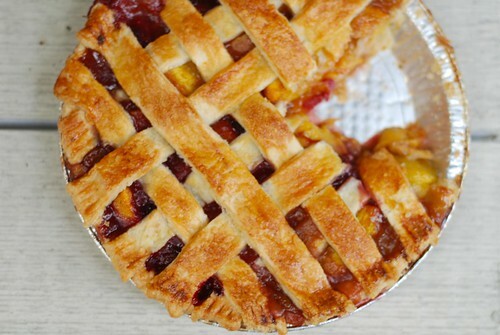 Then I saw this picture of a stone fruit lattice pie, and knew immediately it was going to be my muse. The recipe from Bon Appétit suggests using orange flower water in the pie filling, and my mind immediately went into overdrive with ideas. I eventually settled on using orange zest instead of the always dependable lemon juice and zest combination in pie fillings. The addition of orange zest turned out to be subtle when baked, gave the fruits a light citrus-y finish that’s familiar, yet a little different. I’m a big fan. Toss peaches, nutmeg, orange zest, and the sugars together in a large bowl. Let sit at room temperature while you work on the crust. Prepare the crust, and mix in “the rest” of the orange zest with the flour if you’re making the crust from scratch. 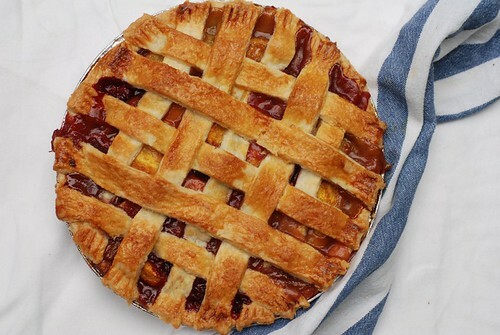 Line the bottom of a pie dish with pie crust, and cut the remainder into strips for the lattice top. Set aside the strips. Drain peaches, and save 1/4 cup of the liquid. Mix reserved liquid with cornstarch and whisk well, then pour back into the peach mixture. Add in the raspberries, toss everything together evenly. 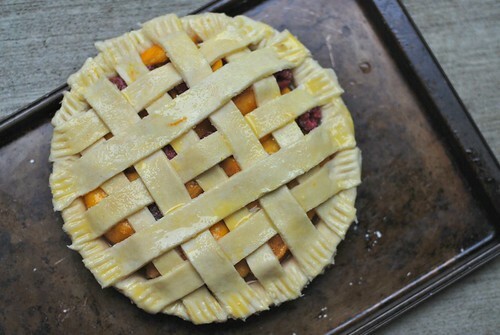 Throw the filling into the pie dish, and top with the strips arranged in a lattice pattern. Brush with egg wash and sprinkle on some sugar. I used granulated, but coarse sugar would be best. Bake on a cookie sheet at 375 degrees for 25 minutes, then reduce heat to 350 degrees and bake until the crust is golden and the filling is bubbly. Remove from oven and let sit for a few minutes before digging in! 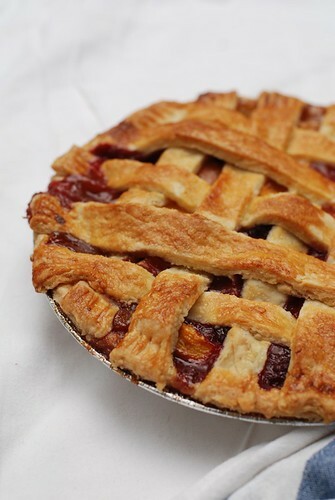 Although the peaches and raspberries were super juicy, I think the cornstarch really did its job in the mixture of holding back the moisture from soaking the bottom of the pie crust. 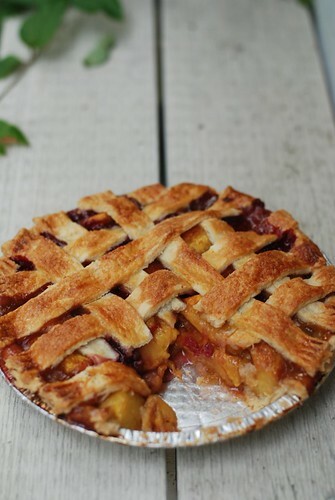 The end result was one very flaky pie on both the top and the bottom, with delicious soft peaches and raspberries soaked in syrup in the middle! Next post: I Can’t Believe I Live in Paris!